Last week, I met a time vampire. It began innocently enough. An old friend emailed me, asking if he could introduce me to a friend of his whom he thought could benefit me. He saw the potential for an interesting partnership, so I chose to accept the introduction. A week later, this man was in my office trying to sell me something I didn’t need or want. He was well-meaning enough, but he was insistent upon taking me through a Powerpoint deck even after I explained that I didn’t need to see the deck. My mind began to wander, and as the minutes ticked away, I realized I had been attacked by a time vampire. Nineteen minutes into a 30-minute meeting, I ended the attack. I had lost 19 minutes of my day, career and life I will never get back. For every professional, every minute counts, so I certainly wasn’t happy about this. But I was grateful for the encounter because it inspired me to write this article. How can I better ward off time vampires in the future, and how can you? 2. Get materials in advance. 3. Be kind, but end when it’s time to end. There’s no rule that if you’ve reserved 30 minutes, or 60 minutes, you have to use the entire time to meet. As soon as you’re totally clear that a time vampire is wasting your time, pause, and kindly say something such as, “Sorry to interrupt, but I don’t want to waste another minute of your time. I’m afraid this isn’t the right time for this for us. Let’s adjourn and keep in touch until the time is right.” Remember, while you’re doing this to protect your time, you are definitely helping the other party as well, as it’s clear that he is also wasting his time on you. The kind, if difficult, thing to do is to end a meeting the minute it’s clear that it’s not a productive use of your time. — Have you fallen victim to a time vampire before? What do you advise? 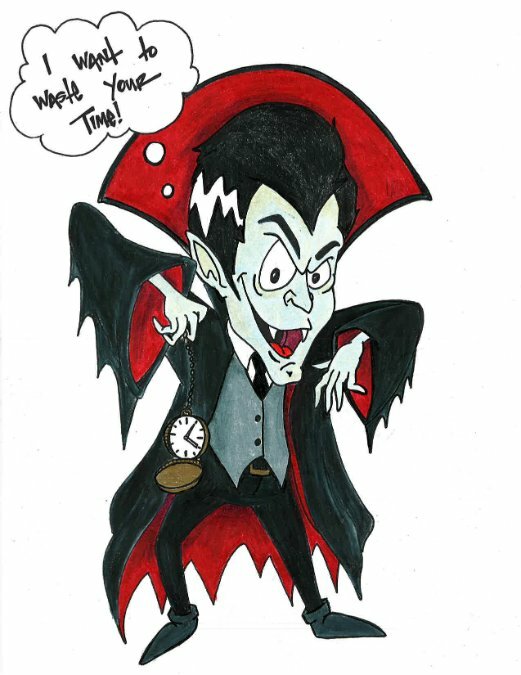 Please let me know your thoughts and experiences in the Comments section below, and please share this article with your LinkedIn network to help keep time vampires at bay! *Thanks for the picture, designed by Veronica Williams.